Congress surreptitiously plans reasonable, bipartisan health care legislation. 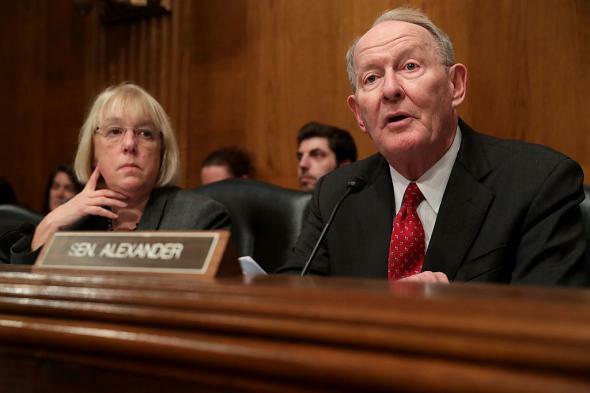 Republican Tennessee Sen. Lamar Alexander (right) and Washington Democratic Sen. Patty Murray on Capitol Hill on Jan. 17. The hearings, set for Sept. 6-7, will focus on stabilizing premiums and helping people in the individual market. In the bigger picture, meanwhile, Democrats—who have in the past downplayed or ignored the Affordable Care Act’s flaws—are preparing ambitious-but-practical coverage expansion proposals of their own for voters to consider in 2018. Trump will ruin all of this, no doubt, with Twitter, and racism.